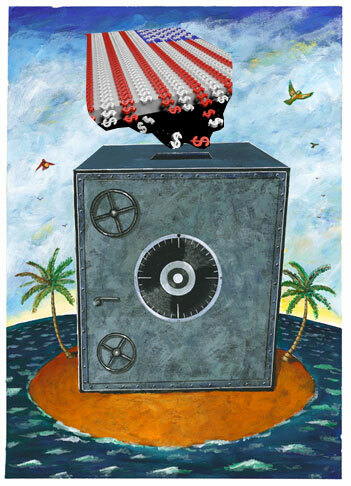 Companies principally used offshore subsidiaries to hire U.S. workers providing services overseas on U.S. government contracts in order to avoid Social Security, Medicare–known as Federal Insurance Contributions Act (FICA) — and other payroll taxes. Setting up foreign subsidiaries allows American defense contractors not only to utilize cheaper labor and more favorable regulations, but also avoid paying taxes that fund key government safety net programs. This conclusion was reached by the Government Accountability Office (GAO), which examined 29 defense contractors and their reliance on offshore companies for their work overseas from 2003 to 2008. GAO investigators found that companies primarily used offshore subsidiaries to avoid contributing to Social Security and Medicare. This avoidance was perfectly legal, thanks to the way Congress crafted the Federal Insurance Contributions Act. Since then, lawmakers passed new legislation in 2008, the Heroes Earnings Assistance and Relief Tax Act, which sought to close this loophole. From the report (PDF) released yesterday by the U.S. Government Accountability Office. Companies principally used offshore subsidiaries to hire U.S. workers providing services overseas on U.S. government contracts in order to avoid Social Security, Medicare–known as Federal Insurance Contributions Act (FICA) — and other payroll taxes. This practice allowed contractors to offer lower bids when competing for certain services and thereby reduce costs for DOD. Our analysis of two contracts showed that the use of offshore subsidiaries saved DOD at least $110 million annually prior to the HEART [Heroes Earnings Assistance and Relief Tax] Act, through payroll tax avoidance. While this practice provided contract cost savings for DOD, it resulted in these companies avoiding payroll taxes that would have contributed to the Social Security and Medicare Trust Funds. The 2008 HEART Act resulted in offshore subsidiaries of U.S. companies paying FICA taxes for U.S. workers performing services overseas on U.S. government contracts. As a result, in fiscal year 2009, four of the case study contractors using offshore subsidiaries to support DOD work requested reimbursement from DOD of at least $140 million for new FICA payments. Federal and state unemployment payroll taxes, however, were not covered by the HEART Act, and several contractors that used offshore subsidiaries have continued to avoid these taxes. In one state, we reviewed documentation for about 140 former employees of several contractors who were denied unemployment benefits in 2009. State workforce officials indicated these benefits were denied because the employees worked for a foreign subsidiary and not an American employer. It seems ironically fitting that private military contractors — which are examples of the presumed benefits of outsourcing — devote so much effort to further outsourcing their operations. According to the GAO from 2003 through 2008, defense contractors increasingly used offshore subsidiaries. Their analysis of SEC filings found that in 2008, 29 of the top defense contractors — accounting for 41 percent of DOD contracting dollars in fiscal year 2008 — had at least 1,194 offshore subsidiaries. Interestingly, as many private military and security contracting advocates claim that the private sector is inherently more cost-effective than the public sector because it can hire lower-cost foreign workers the GAO report noted that the need for security clearances for U.S. personnel working on certain DOD contracts, as well export control provisions, limit the types of defense work that can be conducted through offshore subsidiaries. None of this is illegal and the Pentagon is aware of the practice. It does not object, as it receives cost savings as the practice allowed contractors to offer lower bids. Of course, the public ends subsiding contractors because it pays reimbursement to those offshore subsidiaries that do make FICA payments. So in the end the only people who suffer, besides taxpayers, are workers who don’t make Social Security, Medicare, and similar contributions. This is just another example of shifting risk and burden to the lowest level of contractors, those actually working on the ground. This may be legal, but it is certainly unpatriotic. And it does not represent a cost saving, merely a cost shifting, and very likely a cost increase over having government workers do government work. Islamaphobes have yet again opted to resort to scare tactics imply that unless this country [South Africa] secures a military arrangement with Uncle Sam, it will be rocked by al-Qaeda laced bombs. Between the ideologically-motivated ignorance of the country’s rulers to the dangers posed by transnational Islamist terrorism as well as the attractiveness of South Africa’s highly-developed infrastructure to terrorist networks seeking a base for and/or a theater of operations, terrorists understandably find in South Africa an enabling environment at the very least. South Africans should not count on their leaders’ long-standing ties to terrorists groups and regimes to immunize them from the danger that confronts civilization in the twenty-first century. 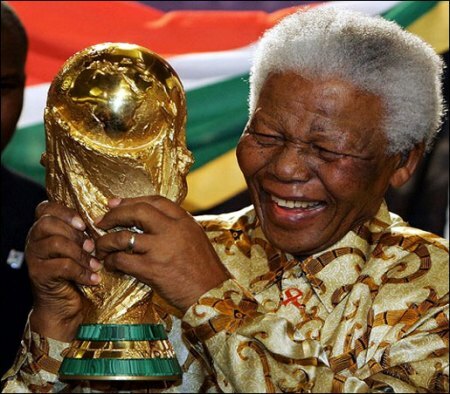 To cite just one example, in a little over two years, in 2010, South Africa will be the first African nation to ever play host to the World Cup Finals, the most widely-viewed sporting event in the world and a target terrorists may find too tempting to pass up. Should anything happen during the tournament, the consequent drying up of tourism and foreign investment would be devastating not just to South Africa, but to the entire African continent. While AFRICOM may not be welcome in South Africa, if the new structure is to “enhance our efforts to bring peace and security to the people of Africa and promote our common goals of development, health, education, democracy, and economic growth in Africa,” it will have to closely monitor – even if from a discreet distance – the foolish playing with fire by the political leaders of that pivotal state before the flames sweep across its entire area of responsibility. His message is that AFRICOM, the US Africa Command, is the only safe protection. In fact the command is probably a more certain provocation than a safe protection. South Africa’s leadership has changed since 2007. I don’t know what Pham thinks of the new leadership, but South Africa no more inclined to welcome AFRICOM than it was before. Now we are hearing those threats continue in the present. In 2010 FIFA World Cup faces propaganda threat from foreign hacks, Iqbal Jassat describes that more threats are being uttered by supporters of AFRICOM. … this country has to-date resisted pressure to allow the establishment of a US military base within its borders. The Americans are committed to have such presence within Africa and despite cordial relations between the Obama administration and the Zuma presidency they have been frustrated by South Africa’s lack of co-operation. Its called Africom. And notwithstanding assurances by senior Pentagon officials that its role is limited to protecting US interests that inter-alia include security in the continent, it is not all that kosher. The current media hype sparked by alarmist reports wherein Islamaphobes have yet again opted to resort to scare tactics imply that unless this country secures a military arrangement with Uncle Sam, it will be rocked by al-Qaeda laced bombs. Paradoxically, it ignores diametrically opposed arguments that would seek to reassure this country that because it is not in America’s military embrace there cannot be any justification for bombing the soccer festival to smithereens. And by the way has anyone given thought to the fact that an arsenal known as “dirty-tricks” is a potent asset possessed by agencies such as the CIA, MI5 and Mossad. This allows them to manipulate public opinion through the commission of horrible acts of terror that frames individuals and groups. Ultimately the end result would be to direct policies of sovereign states to the extent that such sovereignty stinks. and continues working to add to the list. Disruption operations are a serious concern. They have been part of the lead up to every coup sponsored or endorsed by the US government around the world. That has been true in Africa since independence. Disruption operations preceded the coup against Nkrumah, and many more since. US Military partnerships are training future coup leaders. You can see a list of US military interventions including coups in this previous post: War Is Peace – US Military Intervention. The threats of violence show the counterterrorists to be the same as any terrorists, using the same threats, fear, and the possibility of violence to achieve their goals. The US military has already been complicit in manufacturing terrorist incidents in the Sahara to justify AFRICOM. These threats should not be taken lightly, but they should be viewed with great skepticism. People should ask serious questions about their origins and motives. photo: JUAN BARRETO/AFP/Getty Images. Port-au-Prince January 19, 2010. 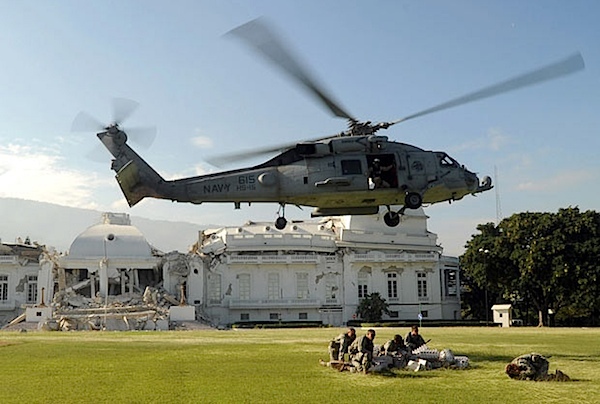 US troops descended by helicopter to take control of Haiti's ruined presidential palace Tuesday, as the military earthquake relief operation gathered pace. As Bag News Notes says: I would love to know how the US military thought this picture would play (in Haiti -- after the first rush; domestically; abroad) in landing American troops at the Haitian Presidential Palace. Was it all gung-ho, or was there an upside/downside consideration? The United States, having stolen so much from Haiti, now dictates what and when foreign aid will reach the Haitian people. … President Obama’s response to the tragedy in Haiti has been robust in military deployment and puny in what the Haitians need most: food; first responders and their specialized equipment; doctors and medical facilities and equipment; and engineers, heavy equipment, and heavy movers. Six Doctors Without Borders/Médecins Sans Frontières (MSF) cargo planes loaded with vital medical material like antibiotics have been redirected to Santo Domingo, Dominican Republic. This will delay MSF staff’s ability to treat patients who urgently need it. Port-au-Prince, January 19, 2010 – A Doctors Without Borders/Médecins Sans Frontières (MSF) cargo plane carrying 12 tons of medical equipment, including drugs, surgical supplies and two dialysis machines, was turned away three times from Port-au-Prince airport since Sunday night despite repeated assurances of its ability to land there. This 12-ton cargo was part of the contents of an earlier plane carrying a total of 40 tons of supplies that was blocked from landing on Sunday morning. Since January 14, MSF has had five planes diverted from the original destination of Port-au-Prince to the Dominican Republic. These planes carried a total of 85 tons of medical and relief supplies. Many of the patients have been pulled from the rubble of collapsed buildings are at grave risk of death from septicemia and the consequences of “crush syndrome,” a condition where damaged muscle tissue releases toxins into the bloodstream and can lead to death from kidney failure. Dialysis machines are vital to keeping patients alive with this condition. People who might have lived are already dead and more are in danger. Those who are lucky enough to get surgery may have no morphine to relieve their pain. While writing this I just saw a clip on Rachel Maddow’s show of US Lt. Gen. Keane being asked about quake survivors camped within 200 yards of the airport who say they have received no aid so far. The General started talking about bringing in troops from lots of countries and ITN reporter Bill Neely had the presence to say they need aid, not troops. AMY GOODMAN: There are now, I think it was announced, 12,000 US soldiers. The Venezuelan President Chavez called it an occupation now. What would you say? DR. EVAN LYON: I think it has real potential to be an occupation. If there are 12,000 soldiers here, it is an occupation. I’ve not known of any violence at the hands of the American military. We’ve also just barely had the beginning of collaboration with them, literally within the last thirty minutes. General Keane, their operations person, finally showed up here after some time. And the military is helping us secure the grounds. But of course this is an occupation. It’s not a—this is a disaster area. Warm bodies help, but military is potentially very destructive in this environment. AMY GOODMAN: What do you need? What would be constructive? DR. EVAN LYON: What we need right now is electricity, water, nurses, surgeons and materials. We have on site right now—we have seven operating rooms up and running. We need about fifteen or twenty within the next twenty-four hours. We have materials to keep the operating rooms going for maybe another twelve hours. Once that runs out, then we’re stuck. AMY GOODMAN: Soldiers haven’t brought you supplies? DR. EVAN LYON: Not yet. DR. EVAN LYON: This question of security and the rumors of security and the racism behind the idea of security has been our major block to getting aid in. The US military has promised us for several days to bring in—to bring in machinery, but they’ve been listening to this idea that things are insecure, and so we don’t have supplies. I’m living here in the neighborhood with a friend. I’m staying with some of my Haitian doctor colleagues. We’ve been circulating on the roads to 1:00 and 2:00 in the morning, moving patients, moving supplies, trying to get our work done. There is no security. The UN is not out. The US is not out. The Haitian police are not able to be out. But there’s also no insecurity. I don’t know if you guys were out late last night, but you can hear a pin drop in this city. It’s a peaceful place. There is no war. There is no crisis except the suffering that’s ongoing. “There is evidence that the United States found oil in Haiti decades ago and due to the geopolitical circumstances and big business interests of that era made the decision to keep Haitian oil in reserve for when Middle Eastern oil had dried up. 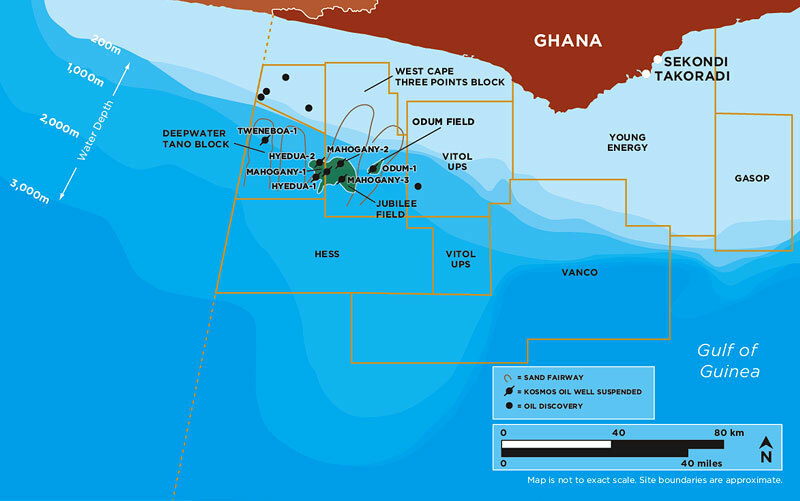 This is detailed by Dr. Georges Michel in an article dated March 27, 2004 outlining the history of oil explorations and oil reserves in Haiti and in the research of Dr. Ginette and Daniel Mathurin. “There is also good evidence that these very same big US oil companies and their inter-related monopolies of engineering and defense contractors made plans, decades ago, to use Haiti’s deep water ports either for oil refineries or to develop oil tank farm sites or depots where crude oil could be stored and later transferred to small tankers to serve U.S. and Caribbean ports. This is detailed in a paperabout the Dunn Plantation at Fort Liberte in Haiti. It is understandable that many African Americans are making comparisons between the militarized character of the U.S. intervention in Haiti’s earthquake disaster and the federal government’s largely military response to the Katrina catastrophe in New Orleans, four and a half years ago. It is quite reasonable to conclude that the U.S. government is more concerned about law and order issues than in attending to the immediate needs of desperate disaster victims – especially when the victims are Black. History tells us that U.S. governments regard masses of Black people, first, as potential threats to security, and only second as fellow human beings deserving of assistance. 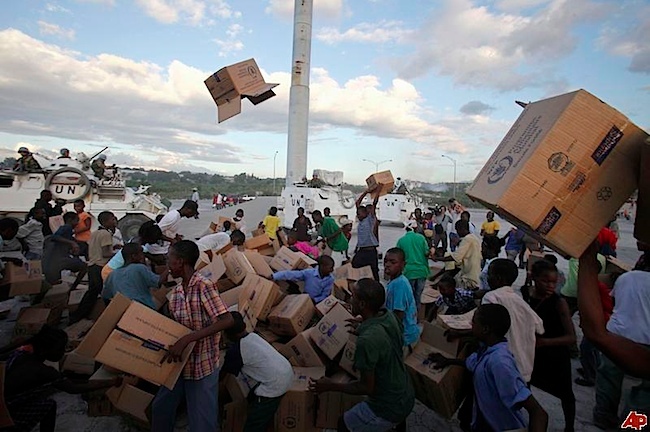 Nevertheless, the heavy-handed militarization of U.S. disaster aid to Haiti should be seen in a larger context. As a matter of established American policy, the military has been assigned prime responsibility for U.S. foreign disaster relief, worldwide. It’s not just disaster relief that has been militarized. The U.S. military command in Africa, AFRICOM, has assumed responsibility for much of the day-to-day duties once performed by the State Department and other civilian agencies. More often than not, the uniformed military is the dispenser of a wide range of U.S. foreign aid in Africa, as part of a general militarization of U.S. relations with the rest of the planet. I would like to add this picture, both as a tribute to the human spirit, and as a rebuke to CNN in particular, and the media coverage in general. We’ve been closely observing the schizophrenia in the Haiti media coverage over the past twelve hours, with some outlets describing a situation of widespread violence and looting … with others showing scenes of grateful Haitian citizens receiving their first food and water in days. It was interesting – though unwelcome – to watch the narrative in the making. The anchor (somebody Lemon) broke away from another story to go to the reporter at a food distribution center, who was reporting unrest. By the time they got to the reporter he had determined that what he thought might be violence breaking out because all the food was gone – was in reality children who had discovered a field full of empty boxes and had started an impromptu game of throwing them up in the air and kicking them and doing whatever it is they do that has kids everywhere so fascinated with empty boxes. The adults were standing around, calm as could be and the reporter was smiling a bit at these children who had been through so much, lost so much finding a bit of lightness and fun in a field full of boxes. The newsreader, however, might as well have not heard a word of this explanation, as he went on being so understanding of desperate people doing desperate things – while a loop of the children throwing boxes went on in the background. He went back to this narrative and loop a couple more times during the show. Then Wolf Blitzer starts his show and continues to promote the same narrative using the same footage of the same children who CNN are trying to make the face of desperate riot and mayhem in Haiti… all because they found some boxes in a field and decided to play. Finally, something you don’t often see: here’s a clip of a CNN reporter on the scene actually correcting the impression. It’s already bitterly ironic that Bill Clinton is the United Nation’s special envoy to Haiti, after the economic policy he imposed there to transform it into the Caribbean’s sweatshop. Now, President Obama has asked George Bush to lead fundraising efforts for relief in Haiti. After Bush took part in an international coup to overthrow Aristide. It’s like sending in the horsemen of the apocalypse to negotiate peace. 2) Keep corporations and corporatist policies OUT. Stop disaster capitalism in its tracks. 3) Cancel ALL Haiti’s debt to the Inter-American Development Bank. 4) Let Aristide return to Haiti. 5) Lift the ban on Aristide’s Fanmi Lavalas political party. 6) Rip up the neoliberal pre-earthquake Clinton-Obama program for Haiti: tourism, sweatshops, privatization, deregulation. 7) Do not allow US military or UN “peacekeepers” to point guns at desperate Haitians. 8 ) Allow all Haitians in the US to work, and remit money home. 9) Release all 30,000 Haitians held in US jails for deportation, and grant them Temporary Protected Status. 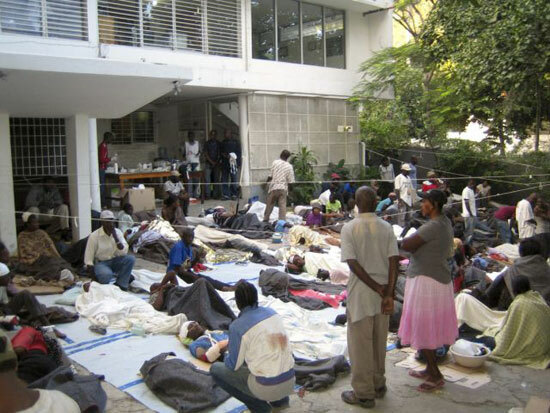 People gather outside a damaged MSF office in Port-au-Prince to receive help after a 7-magnitude earthquake hit the capital city on January 12. It would be nice to give something back to Haiti, especially when help is so urgently needed. A friend in the medical profession sent me this appeal. I made a contribution and I recommend the opportunity to your attention. As my friend said: This is a great organization, please consider it if you are planning to donate to help. Donate here to support MSF’s work in Haiti. The first reports are now emerging from Doctors Without Borders/Médecins Sans Frontières (MSF) teams who were already working on medical projects Haiti. They are treating hundreds of people injured in the quake and have been setting up clinics in tents to replace their own damaged medical facilities. The Martissant health center in a poor area of Port-au-Prince had to be evacuated after the earthquake because it was damaged and unstable. The patients are now in tents in the grounds and the medical staff have been dealing with a flow of casualties from the town. They have already treated between 300 and 350 people, mainly for trauma injuries and fractures. Among them are 50 people suffering from burns—some of them severe—many of them caused by domestic gas containers exploding in collapsing buidings. At the Pacot rehabilitation center another 300 to 400 people have been treated. In one of MSF’s adminstrative offices in Petionville, another part of Port-au-Prince, a tent clinic there has seen at least 200 injured people. More are getting assistance at what was the Solidarite maternity hospital, which was seriously damaged. So many of the city’s medical facilities have been damaged, healthcare is severely disrupted at precisely the moment when medical needs are high. MSF is also working to get more staff into the country. Around 70 more staff are expected to arrive in the coming days. MSF is sending out a 100-bed hospital with an inflatable surgical unit, consisting of two operating theaters and seven hospitalization tents. Nephrologists will be sent as part of the team in order to deal with the affects of crush injuries. However, transport links are difficult and it is not yet clear whether supplies and medical staff will have to go in through neighboring Dominican Republic. MSF is also concerned about the safety of some of its own staff. There are 800 of them and not all have yet been accounted for because of the poor communications and general disruption. Oxfam International has an ongoing presence in Haiti, and are working with the critical issues of water and shelter. “I have seen wounded people flooding into the hospitals and buildings of several stories high that are now totally flat. Several thousands have probably died in the quake, but it will it will take time to get a full picture. Bodies may stay under the rubble for a long time because it is difficult to access some sites and heavy lifting equipment is in limited supply. “There are bodies all over the city. People have nowhere to put them so they wrap them in sheets and cardboards in the hope that the authorities will pick them. People have also piled bodies in front of the city’s main hospitals. “Oxfam’s teams have now started to assess the scale of the disaster across the different parts of Port au Prince as some have been more severely affected than others. The epicenter was near the slum of Carrefour, where people were living in flimsy shacks. There are reports that over 90% of its buildings are in ruins. Oxfam is preparing to send stocks from its Bicester Warehouse in Oxfordshire, UK. Materials that will be sent include plastic sheeting and equipment for water distribution, purification and storage. Communication has been difficult since the 7.0 on the Richter scale quake struck 10 miles southwest of Haiti’s capital, Port-au-Prince, but the situation is undoubtedly grave. Homes, office buildings, roads, schools, hospitals and hotels have collapsed. Millions of people are affected and the aid agencies need millions of dollars to get aid to all the people that need it. Talks are underway to add a special-purpose Marine air-ground task force to U.S. Africa Command, a move that would center on expanding efforts to train African militaries, officials say. Seabasing exercises have been ongoing for some time with the African Partnership Station, and other Naval exercises around the coasts of Africa. 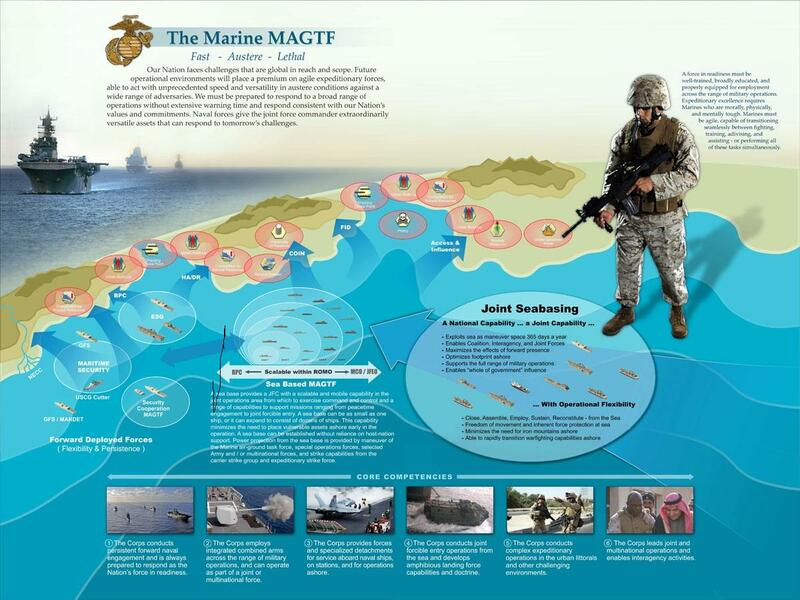 The graphic above is from a Marine Corps information page on Seabasing. It offers more information, text, graphics, and videos. As the title states, the reason for seabasing is to overcome access challenges, such as not being welcome in the countries the MAGTF wishes to access. You will not find much about training partners in these documents. MAGTFs are quick-reaction units that range in size. The smallest comprise only a handful of troops, while the largest include thousands. Media reports published in December suggest as many as 1,000 Marines could be stationed in Europe as part of an AfriCom MAGTF, though neither the Marine Corps nor AfriCom would confirm how large this task force could be. And both entities were careful when speculating about future basing options, saying only that prospective locations are being studied and that Europe, with its established infrastructure and proximity to Africa, is a logical contender. Locating a MAGTF on the African continent is not an option, officials said, even though Marines already deploy to Camp Lemonier, a joint expeditionary base in Djibouti, just north of Somalia. “It’s phenomenally diplomatically sensitive when you start talking about stationing troops in Africa,” said Vince Crawley, a spokesman for AfriCom. Marines already conduct regular bi-national training with a number of African nations, including Egypt, Kenya, Benin and Senegal. The size and makeup of these training teams varies from mission to mission. Marines are requested based on the skills needed to complete the task at hand, be it air-support training or instruction on urban combat tactics. Having Marines assigned to Africa for longer periods of time could give them more time to conduct Africa-specific cultural training, making those exercises more effective and resulting in stronger ties with partner nations, Fontana said. AfriCom was created when the Horn of Africa gained greater focus as the U.S. increased efforts to disrupt suspected terrorist activities in countries with unstable governments. A permanent Marine task force also could prove valuable to counter-terrorism efforts throughout the region. Keep in mind that counter terrorism is just another expression of terrorism. It certainly should worry African leaders. And it should most certainly be diplomatically sensitive. It should set off alarms all over the continent. A 1,000-strong Marine combat task force capable of rapidly deploying to hot spots could soon be at the disposal of the new U.S. Africa Command, which up to now has stressed training partnerships and security cooperation to wary African governments suspicious of U.S. military intentions on the continent. But the Marine Corps Web site mentions very little about training when talking about the capabilities of a Marine Air Ground Task Force, or MAGTF. Who would need to give permission for these strike forces to strike? What would constitute a legal and appropriate use of these forces? Suppose the US government, or US based corporations do not like the policies of a certain African government? Would that government be subject to attack? Or suppose the US government or US based corporations are very happy with a particular government but that government is highly unpopular with its own people. Will the US strike against the opposition? Would it strike against political demonstrations? What would make such a strike legitimate? I can’t think of any good answers to these questions, but they must be answered, and in fact will be answered, in deed and by default, if not in diplomacy. The message the US is sending is that it is entitled to take what it wants, wherever it wants, by force. This is the basic message of colonialism.